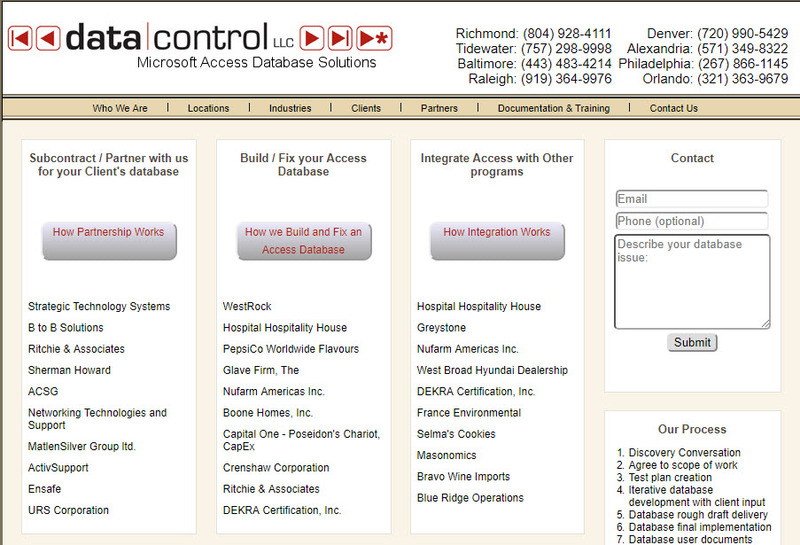 You can control your web content with an Access Database. That’s how we run our website(s)! We’re going to concentrate on the first list of clients: Subcontracting. Notice that the last client in the list is URS Corporation. 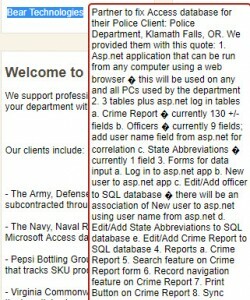 You’ll notice that we 12 have clients listed with sort orders 1,2,3,4,4,5,6,7,8,8,9,and 10. 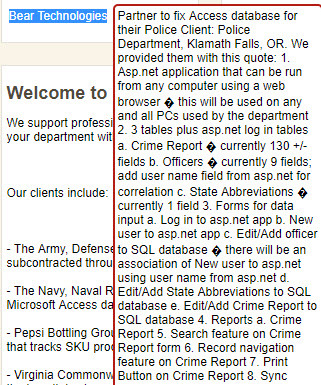 The website is programmed (that is the list box on the website is tied to a query in a SQL Server database) to show the first 10 clients based on their sort order. Notice that Bear Technologies in the Access database has a sort order of 9. But because there are two clients with a sort order of 4 ( ShermanHoward and ACSG ) and two clients with a sort order of 8 (Ensafe and URS Corporation); Bear Technologies with a sort order of 9 doesn’t make it into the top 10. So let’s change this. We’re going to change Ensafe’s sort order to 908 in the Access database and then refresh the website page. How does the Access database change the data in the website? 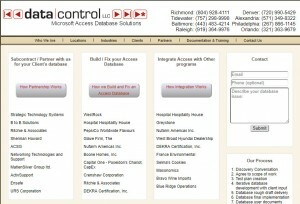 Notice the linked tables in the Access database. 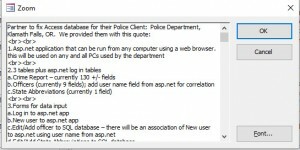 If we hover over the tblClients table we see that it is actually a SQL Server table located on our web server. We built our web page using a WordPress template, then thoroughly modified the entire site with PHP code against a SQL Server Database. 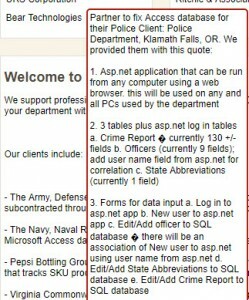 We link our Access Database to the SQL Server database as well. So when we want to update the content of the website, we simply open the Access database and make changes. Why is this important? Well, besides the obvious advantage that it is super simple for us to make quick changes to content, Google ranks websites higher if the website is constantly updating the pages. Guess what? If we change the sort order in our Access database so a different list of clients is 1 – 10, then we’ve changed our website’s data so Google will rank us higher. And how easy is it to simply change sort orders? We can’t see the special characters from the zoom in Access. But we know the first one occurs after ‘…using a web browser…’ So apparently our website doesn’t like the ‘-‘ character. We’ll remove this and refresh the screen. We’ll also put in a bunch of <br>,<br> line break tags to space out the text better. A little better but not perfect yet. But I hope you now see how you can tie your website’s content to an Access Database. Have your website’s content retrieve from either a SQL Server or MySQL Database on the web server. Then connect your Access database to that same SQL Server/MySQL database and voila! 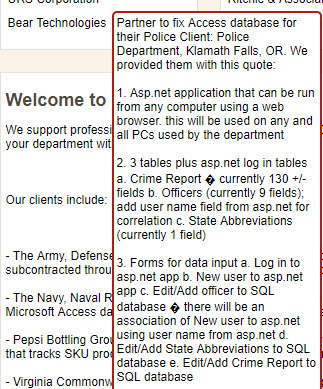 This entry was posted in Access and SQL Server, Access Code Examples, Access Database on Web. Bookmark the permalink.